When thinking about how I’d choose someone to walk my own dog, I thought it would come down to getting to know more about the person who would be doing the walking. So to help you choose someone to walk your dog I thought it would be useful to write a few notes about me. I’ve lived in Wallingford for 32 years, and have had Flint my Springer for 12.5 years. I ran a small dog walking business for a couple of years prior to starting working in an office in February 2010. After a year of looking at a computer screen I decided in March 2011 to return to something I really love – dog walking. I walk Flint for 2 walks every day albeit they are slower now. Flint and I are well known in the Wallingford area by many regular dog walkers. If you would like to meet me to discuss walking your dog, I’d love to come to your house or meet for a walk with you and your dog. Its important to me that your dog gets to know and trust me. I am currently doing a diploma course to follow to further my knowledge of canine behaviour. I am also a member of NARPS and completed a course on dog sitting and walking. I am insured by Cliverton as a professional dog walker/sitter. I am CRB checked through my role as Secretary of Wallingford, Mini and Junior Rugby club. I’ve had a successful career in the Hotel industry and have held several positions of responsibility over the years. This one I would count as being one of the most responsible, looking after your best friend. Character references are available on request. 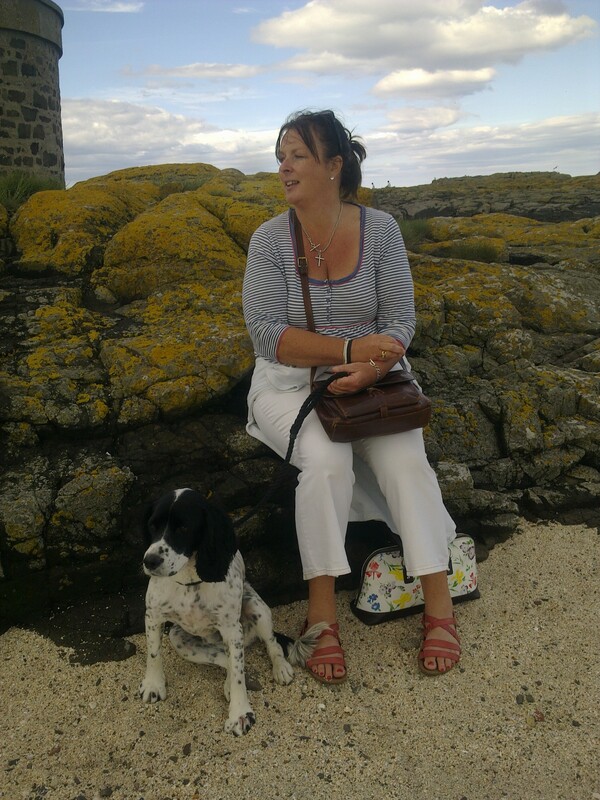 Flint and I sitting on some rocks at Farne Islands, Northumberland. Nicely presented and imformative website.